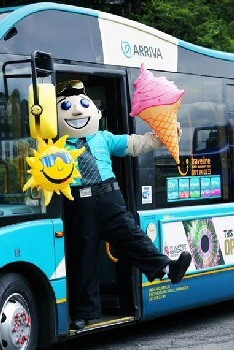 ITS game on for Arriva customers this summer, as the bus operator offers up a bumper package of gifts and treats sure to put some sunshine in the season, whatever the weather may bring. A bounty of brilliant prizes worth over �300,000 is currently up for grabs to people heading online and trying their luck on:- 'Top Deck' Arriva's virtual scratch card. With holidays, days out, bikes, toys and shopping vouchers all hidden behind the game's squares, there is something to brighten even the darkest of summer days. 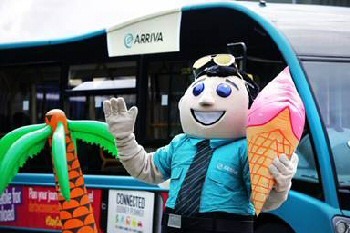 Debra Heaton, marketing and communications manager, from Arriva North West, explained:- "Summer should be a time of fun, and here at Arriva we pride ourselves on ensuring we are able to help give people better access to that fun by bus, wherever it may be. So to celebrate the onset of the summer holidays we are hoping to banish any potential bad weather blues by guaranteeing to put smiles on the faces of people across the UK. With over 15,000 people wonderful seasonal treats to be won, all you have to do is register to play 'Top Deck' online and you could be claiming a super sunny surprise!" To play, simply visit:- ArrivaWin.Co.UK and sign up to My Arriva. Those already registered to My Arriva should just enter their log in details. Plays are limited to 1 per person. Terms and conditions apply. Timetables and details about services in Southport are available at:- ArrivaBus.Co.UK/North-West.